Key duplication. 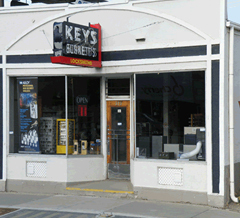 Burnett’s carries the widest selection of key blanks in Western Canada. We can duplicate most keys from antique keys, to the latest high security automotive keys. Automotive keys with a transponder (transmitter) chip in the head are a specialty of ours. We can duplicate your transponder key, quickly and often at a price considerably lower than the dealer. We carry a full line of commercial and residential locks including. Schlage, Weiser, Sargent, Yale. Burnett’s carries two high security lock lines: Medeco and Abloy; which can provide high security locking devices with restricted key control. With an increase in safety requirements for mining and manufacturing, Burnett’s can provide safety lockout systems that include safety padlocks, safety padlock stations and all safety accessories. Our main supplier is The Master Lock Co. Custom lock engraving is a specialty of ours. Electronic High-security equipment and service. We carry the lastest in electronic security devices including card access and key fob technology. We can repair and replace many automotive locks and we stock a good selection of replacement locks for foreign and domestic automobiles. New and used safe sales plus safe opening and repair services. Please check our main suppliers’ online catalogue at Brawn Security. We stock many safes and have access to many more. We can design and build safes and safe inserts to your meet your specifications. Come visit us at 323 3rd Ave. S, Saskatoon SK S7K 1M6; or email us at burnettskeys@sasktel.net; or call us at (306) 244-6032 Fax 306-244-7084.